What follows is a selected extract from my research proposal that gives an insight into my own harmonic practices. I hope you find it interesting! Since beginning the PhD course in September, I have completed three pieces for various chamber ensembles: Focus for chamber orchestra, H.O.C for the Marici Saxophone quartet and A Sentimental Tension for the Fidelio Piano Trio (all have been recorded and performed). Each piece contains elements or episodes that are tightly linked to compositional insights gained from my reading and research (especially in terms of harmony). While, at this stage, each piece can essentially be seen as a ‘study’, there is also present a great deal of exploration and development in terms of my own compositional process(es), aesthetic approaches and values, as well as general compositional skills and orchestrational competency. With reference to specific examples from the piece H.O.C as a case in point, I will go on to summarise such instances of enquiry and draw some parallels between my work and my research. H.O.C received it’s premier at the National Portrait Gallery in London and was performed and developed in collaboration with the Marici Saxes, a professional, London-based ensemble. The writing brief for the piece was to compose a work that drew inspiration from a particular painting displayed in the room where the piece would be performed. I chose to work with Sir George Hayter’s “House of Commons” (1833-1843), which depicts, as the name suggests, the packed interior of the House of Commons; from the painting I developed a work that drew conceptually from ideas of progress through dialectic, and this manifests most clearly in it’s ‘debate-like’ form. At the time of writing the piece, I had been researching various harmonic techniques employed by Thomas Adès and Oliver Knussen, and many of the techniques used in the piece are derived directly – though developed to suit my own stylistic and structural goals – from analyses of works by these composers. In particular, John Roeder’s Co-Operating Continuities in the Music of Thomas Adès (2006) and Julian Anderson’s Harmonic Practices of Oliver Knussen since 1988: parts I and II (2002) were intensely appropriated and greatly supplemented my own analyses and understanding of the composers’ techniques. The first and most clear adoption of such intervallic techniques is shown in Figure I. While developed reiterations of the ‘primary motif’ (as labelled) begin from the final pitch of its predecessor, the intervallic contour of the motif is expanded by increasing each interval by a semitone. This technique used in conjunction with a clear and satisfying contour forming the primary motif, has a clear and valuable aural effect; it tends to naturally engender a sense of directionality and – of course – expansion. Though it is relatively clear from Figure I, it should be said that the use of such a system is intuitively and aesthetically informed; the harmonization and the phrasing is composed almost impressionistically as a reaction to the theme’s melodic character and had this character not been appealing, I may not have embarked upon the endeavour. The ‘seriality’ of such a system is both adhered to and selectively ignored in favour of a greater good. Though I’m reluctantly urged to draw such a comparison, I believe this almost blasé and yet pragmatic approach to intervallic systems represents a corollary between Thomas Adès’s approach and my own. 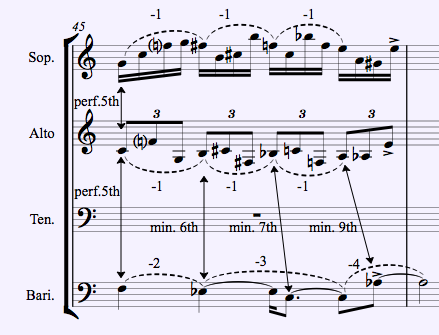 For example, in the extract shown in Figure II from Roeder’s analysis of Adès’s Living Toys (1998), the application of expanding intervals is applied as a vertical process; one registral (or harmonic) layer moving further and further away from another. What strikes me most about this use of a simplistic generative factor are the raw materials that Adès submits to them (the consistent descending major 6th dyad) as well as the life-span of the successive generations to which the degree of consonance seems – to me – a mitigating factor. Had the system progressed any further and not been partly abandoned, Adès would have run into ‘unsatisfying’ octave doublings and other such conventionally avoided harmonic faux pas. It seems that rather than passively letting such systems run their course (which, it should be granted, has a particular aesthetic), Adès employs them judiciously and interferes with them to bring about a logical coherence at the service of a vibrant, direct and ultimately musical idea; not so much an ideological tension, but instead, perhaps, a manifestation of post-modern ideals. Nevertheless, I have adapted and combined such techniques for my own means in H.O.C.. Figure III shows another example of how I’ve incorporated such intervallic systems, using expanded interval sets. On its face, John Roeder’s analysis of Adès’s use of intervallic systems seems to be generously comprehensive. However, a hardly damning but important critique of the paper might be that he, at very least, glosses over, (and at worst, completely overlooks) the rationale behind supposedly anomalous deviations from otherwise purely serial processes, as outlined earlier. While such moments of incongruity may be expected to act as tangents or instances of surprise, this is far from the truth; instead, the system is selectively bent to both the episode’s stylistic implications and in accordance with Adès’s canny melodic intuition. This observation sits very much at the heart of both my research interest and compositional practice. There are many such examples where experimentation with these types of systems have occurred in my music and, though omitted from this proposal for the sake of brevity, will likely be a main area of investigation in the critical commentary section of my PhD submission as well as representing a heuristic insight to other analytical endeavours; it may even be the argued case, as is apparent from Figures I, II and III, that how the adopted system is creatively adopted to be effective is of most interest. I also believe that the adoption of such techniques into my compositional practice has improved the quality of my work. Furthermore, and perhaps more crucially, I wish to further investigate and challenge this imposed binary between improvised, intuitive composition and constructed compositional practices as well as document how these discrete ways of working mutually inform one another in my own work. Hmm it appears like your site ate my first comment (it was extremely long) so I guess I’ll just sum it up what I had written and say, I’m thoroughly enjoying your blog. I too am an aspiring blog blogger but I’m still new to the whole thing. Do you have any tips for newbie blog writers? I’d really appreciate it.